We are renowned firm engaged in offering our clients a wide assortment of Embroidery on Kurti. Our embroidered kurtis are highly praised for their artistic embroidery work which enhances the look of the wearer. These Kurtis are embellished with stones and crafted with beautiful designs and patterns. 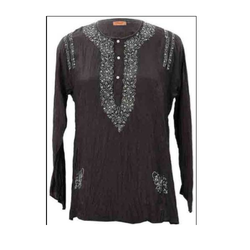 Our array of beautiful ladies apparels includes an exclusive collection of Embroidery on Kurti. These Kurtis can be easily paired with leggings and jeans for creating a decent look for office goers. Our embroidered kurtas are highly praised for their artistic embroidery work which enhances the look of the wearer. Comfortable and relaxing to wear. Looking for Embroidery on Kurti ?